Comparing the PNW District t-shot to previous years, it's easy to see that the retention level is good. Members are not leaving Optimist Clubs at an alarming rate. However, it is also evident that new people are not rushing in to join an Optimist Club. That is not an unusual situation. This may be a simple statement, but we fully believe that one of the reasons we don't have membership growth is that we just don't ask. We don't ask others to join our Optimist Club. We could look at the many reasons behind this phenomenon, and perhaps we will in the near future, but for now, we want to remind you that the time is always right to ask someone to join an Optimist Club. Doing good in your community and bringing out the best in youth and yourself is a timeless and priceless pursuit. Please #joinanOptimistClub today. Click here to find an Optimist Club in your community. If there is not an Optimist Club near you, please send a message and we will help you get one started. Bringing the second quarter meetings to a close, the Washington Oregon Super Zone Meeting for the PNW District was held March 24, 2018. It was a small turnout, with most representation from the furthest distance Optimist Clubs of Roseburg, Tri-Cities, and Tacoma. Also on hand were members of the Portland-area Optimist Clubs of Vancouver, WA, Portland Northeast, Oregon City, Gresham, and Hillsboro. Governor Bruce and Judy Gilbertson traveled from Salem, Oregon to be with us. In all, there were about 20 Optimist Club members in attendance. Lieutenant Governors Scott Keller, Peter Sudduth, and Gary Smith expressed special concern with club presidents not returning email or phone calls making it difficult to plan and frankly, to learn the projects and health of the clubs to which they are assigned. For those who have been in their roles before them, we understand this to be a common problem. It is a sad situation, however, when only seven Optimist Clubs in the entire district appear to be holding the Optimist International Oratorical Contest. What can we do to correct this? As always, those in attendance shared information about the club projects about which they are the most passionate and it is always good to gather inspiration from others with shared values and goals. As stated in an earlier post, I will hope and continue to lobby for a return to a full district meeting in the second quarter. At the very close of the meeting, as he did at every Super Zone gathering, Governor Bruce shared a webinar produced by Optimist International about Optimist International structure and governance. One of the main points of the webinar is that the District is an administrative arm of Optimist International and exists to help its clubs succeed. The ability to gather its club leaders together is a primary step in sharing information, tricks, tools, and resources for club growth and achievement. This is better accomplished when priority and importance are expressed through the gathering of the whole body for recognition, education, and most of all, the inspiration that we gain from one another. Moving forward, I fervently hope, this level of relevance may be communicated to all members of Optimist Clubs in the PNW District. Click here for photos on Facebook. What happens after an Optimist Club level scholarship contest? 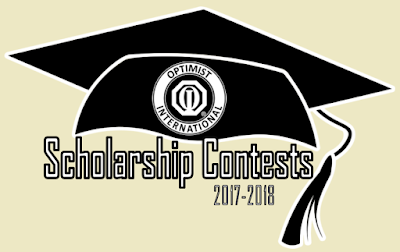 It is Scholarship Contest season for Optimist Clubs. Students begin their quest for all scholarships by participating in the Optimist International Essay Contest, Optimist International Oratorical Contest or Communications Contest for Deaf and Hard of Hearing (CCDHH) at their local Optimist Club. From there, local winners move on to Zone, Regional, or District level competition. 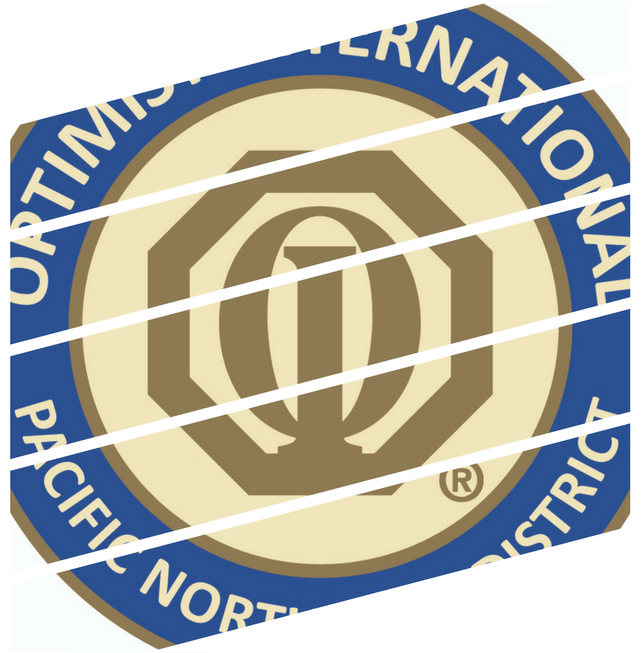 In 2018, the PNW District fee for each qualifying contestant is $50 per entry at the second level of competition paid by the sponsoring Optimist Club. The Optimist Club Essay Contest winner moves directly into the District level competition when the club chairperson mails the winning essay, all required paperwork, and $50 to the District Essay Chairperson. This is for reference only as the entries were due on February 28, 2018. The winning contestant is announced at the PNW District third quarter meeting. The Lieutenant Governor plans the second-level of the Optimist Club Oratorical Contest in each Zone. They set the date and location, typically in April, arrange for judges, and most important, communicate with the clubs to encourage their participation in the contest. The Optimist Club may send its first and second place contestants to the Zone level competition. To participate, each winning student must have the required paperwork and the $50 registration fee. Two contestants, the first and second place speakers, in each Zone advance to the District level competition. There they will meet other contestants that have gone through similar procedures to reach this level of participation. In 2018, the PNW District competition is being held at the third quarter meeting May 11-12 at the Hampton Inn near Mill Plain Blvd., Vancouver, Washington. Students should arrive late-afternoon Friday. They will share a room with another contestant. District Committee Chair hosts dinner for the students and usually, there is an activity like bowling, swimming, or a movie. Rise and shine Saturday morning for breakfast. We hope the contest is in the morning - it typically is - so that participants can get past any nerves and enjoy getting to know one another. The District Committee Chair will host lunch and take students on an area activity in the afternoon. Return for the evening banquet with the Optimist Club members, other participants, and families, to learn who has won the PNW District scholarship prizes of $2,500, $1,500, and $1,000. Evening break with families and new friends. Students who are traveling with parents may leave at their pleasure. Others will remain for breakfast Sunday morning at the hotel. The first-place winner should meet with the District Chairperson to learn of the next level of competition as an entry in the Optimist International Global World Championships. This portion may be done online or in person. The Regional winner earns an additional $5,000 scholarship and the opportunity to compete for $15,000 more. The CCDHH may follow a similar path as the Optimist International Oratorical Contest; however, since participation is much lower, it has, in the past, generally been run in cooperation with a school program for deaf students. We have been advised that the CCDHH will not be held at a district meeting in 2018. This post is for informational purposes in order to satisfy a number of inquiries that we have received. Please contact the PNW District Chairpersons for further information: Essay | Oratorical | CCDHH. Scrolling through my Facebook feed, I am always inspired by the North Okanagan Optimist Club. The members always look happy, its messages are uplifting, and the activities are purposeful. The club is located the furthest distance from the PNW District and in a way, it does its own thing; however, youth is forefront in its mission and sharing a positive mental attitude is an equal pursuit. The North Okanagan Optimist Club certainly lives up to its name. On Saturday, March 17, 2018, North Okanagan Optimist Club members joined the "Seedy Saturday" Fair and shared their popular programs: Unplug and PLaY WEEK, Playground Boxes, and more. What's more, I bet they also invited others to join in their optimistic causes by being a member of the Optimist Club. The members are always planting seeds of optimism and watching them grow in Vernon, BC. Once a year, all the world turns Irish. People look for four-leaf clovers and the pot of gold at the end of the rainbow. They wear green clothes, eat green food, and speak with an Irish brogue even though they have never been to Ireland. For one day, many people feel an affinity for a common theme, an idea that makes them happy. That feeling is like being part of an Optimist Club. As an Optimist Club member, one has an affinity for positive thoughts and they seek to do good things, especially in their community. Optimist Club members work together to make the world a better place to live. They help children and adults alike in the pursuit of this mission: to bring out the best in youth, community, and ourselves. 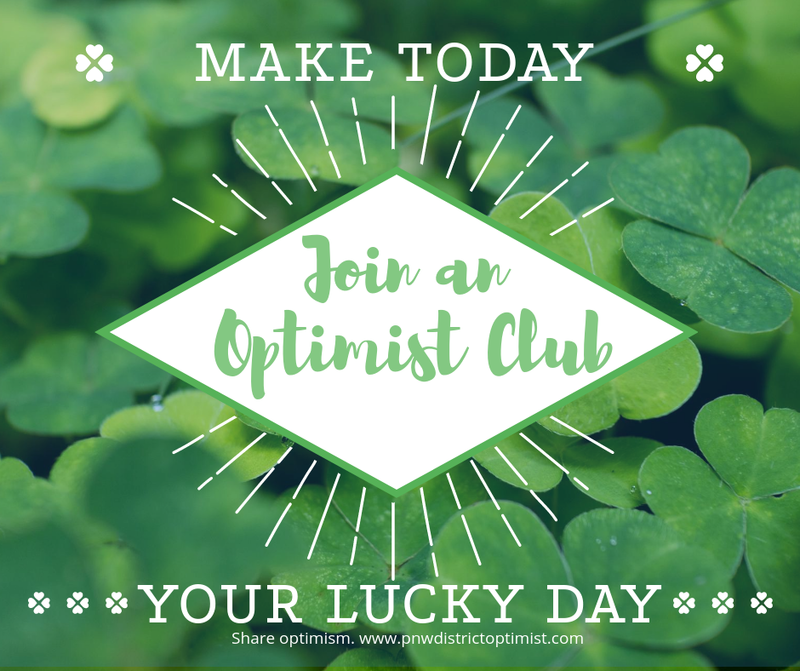 Every day is a lucky day when you are a member of an Optimist Club. You can do it! 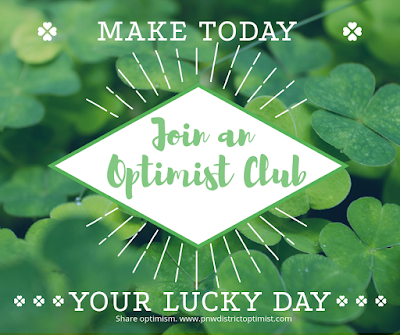 Make your day lucky: #joinanOptimistClub. If there is not an Optimist Club in your community, we would love to help you start one. 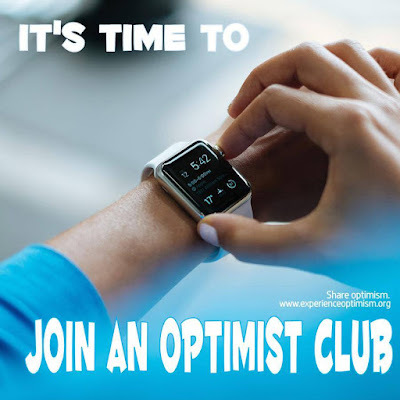 Click here to start a new Optimist Club today. pledged $10,000 to the nonprofit organization that provides child abuse intervention in Benton and Linn Counties with the money earmarked for new facilities construction. 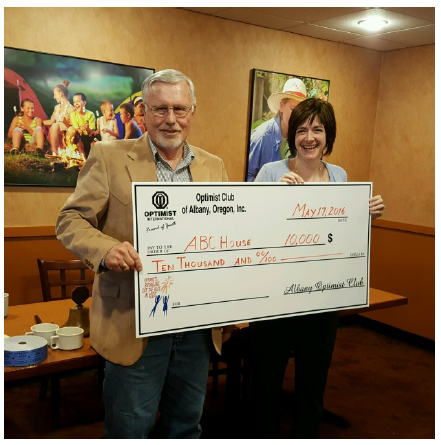 On February 27, 2018, the Albany Optimist Club fulfilled its commitment with the final $3,000 installment. On hand to receive the donation was Jennifer Gilmore-Robinson and she shared pictures of the progress that is being made on the building. According to club bulletin editor Jack Towns, in a surprise move, the Optimist Club also donated an additional $500 "for good measure" and purchased a $500 table for the organization's upcoming fundraising program. We extend a big thank you to the Albany Optimist Club for serving the youth and community with this gift. Optimist Clubs in the Pacific Northwest District of Optimist International are going through a seemingly endless series of "super zone" meetings in place of a district meeting for the second quarter of the 2017-2018 administrative year. It seems endless for the first was February 17 and the last will be March 24. According to my Facebook stream, most other districts have already held one-day affairs where they celebrated the accomplishments of their respective Optimist Clubs for the 2016-2017 administrative year. It is a sad circumstance that the PNW District has little to celebrate; however, that is no excuse for not gathering the troops together for a "super dose" of motivation. This is my soapbox, so to speak, for encouraging an end to the practice of second quarter super zone meetings. The super zone meeting is a plan promoted by some governors to bring District-level information and education to the local level. Not a bad thought, but isn't that the purpose, or shouldn't it be, of every zone meeting coordinated by the corresponding lieutenant governor? Some cite the possibility of poor weather conditions as a reason to hold the local meetings. They say that way, fewer members will have to to have to travel far distances to attend; plus, there is the possible bonus that with the meeting being close, more will want to participate. I don't know whether that has proved successful. From the meetings I've been to over the years, I would say not so much. The Optimist Clubs in the PNW District will come together as a whole for the third quarter meeting on May 12. That will mark only the second time that the District's Board of Directors will have met since the first quarter meeting in October. What's happened since that time? Have the club presidents been kept informed of the goals of the District and how their Optimist Clubs are part of the plan of success? Have the club presidents provided counsel to the governor and been given the opportunity to provide fiduciary oversight to the District as is their responsibility as members of the Board of Directors? Here is the big question: are all working to leave their clubs and the district better than they were when they took office? Time will tell, I guess. Over the past two years, the third quarter meetings have accomplished little more than serving as a platform for the Optimist International Oratorical Contest and Communications Contest for the Deaf and Hard of Hearing. As inspirational as the students may be, there has been no training or education and the District Board Meeting has been reduced to the election of the lieutenant governors for the coming administrative year. That has provided little incentive to help the clubs grow right here, right now. If the District is to return to a growth model, the administration must return to a growth message. The best way to deliver that message, concisely and consistently, is to return to education first and leave the social by-product as the second important reason for coming together. Of course, the point of my message, is we need to come together as a District in the second quarter to celebrate the achievements of the previous year and to inspire achievement in the current administration. This is the time to provide last-minute encouragement and advise the process for entering the District-level Optimist International Scholarship Programs, among other things. It is the time to grow stronger with one another as clubs plan for the calendar year ahead. A famous American once said that a house divided cannot stand. The same is true for the PNW District. As much as a super zone meeting may encourage localism, it discourages unity. When each group learns something different from the other, there is the risk that each will go its own way and soon, it may not need the others at all.